Increasingly, I suppose, few of us really know what village life is like because of urbanisation and the drift to city life, but this collection punctures any naïve ideas that village life is serene. Each story reveals what lies beneath the surface: universal emotions and anxieties, and lives that defy stereotypes. The theme of loss and longing permeates the whole collection; it is melancholy in tone. All the stories are a bit unnerving, but it was ‘Relations’ which unsettled me most. An ageing school-teacher goes to meet her nephew who is coming to the village to recuperate after a kidney operation. He doesn’t turn up, and although the story explores all the possible reasons for this, including that he might just be a thoughtless young man who’s got a better offer elsewhere, perhaps from a girlfriend, the unease is compounded by Israel’s sense of siege. Depending on personality type, most people catastrophise to a greater or lesser extent when a loved one is missing. But if you live in a State where ordinary people on public transport or in public places have been targeted by terrorists, then the fear that something has happened has a different quality, I am sure. You only have to travel on the London Tube or an Intercity in Spain to experience that low-level anxiety for yourself. In this story, this unresolved absence is compounded by the final sad image of the aunt alone with the fancy meal and the special preparations she has made. Whether the young man turns up or not, her reflections show that she has lost him anyway, and more besides. Although Oz’s descriptions of life in this village seem uniquely Israeli the themes are universal. Like many pretty little villages the world over, Tel Ilan is in transition from rural backwater to summer resort. In ‘Lost’ a real estate agent has his vulture’s eye on a property ‘ripe for development’ and amongst the other villagers that he knows so well, he’s aware of hostility to his business. One motif that stood out for me in this collection was the notion of trespass. People venture where they ought not: a mayor tears his hand on a barbed wire fence put there to keep him out; a guest enters a room kept private for a very good reason, an adolescent seeks solace in the dark spaces of a library. As Elizabeth Gaskell did in The Cranford Chronicles so many years ago (see my review), Amos Oz has reminded us that people are complex and interesting no matter where they live and what their circumstances are. But there are also aspects of life in Tel Ilan that remind us of their need to be vigilant and alert at all times: an abandoned package that should be reported to police; fighter jets flying overhead; a would-be Arab writer who inevitably evokes suspicion and hostility. 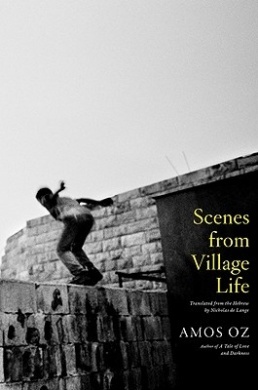 Scenes from Village Life was longlisted for the 2012 Independent Foreign Fiction Prize and I read it for the Shadow Jury convened by Stu of Winston’s Dad. To read other reviews by the Shadow Jury, click the logo on the right. Source: Latrobe City Library via ZPortal. Yes, yes and yes. I forgot to comment on the translation, but it’s very good. Thanks, Mark. I’ve just got an email from the library about Blooms and will be able to pick it up next week so I’ll soon be able to see what you mean.